When the weather is inclement, use the HomeKite! There’s nothing worse than wanting to go outside and fly a kite, only to discover there is absolutely no wind. The normal response is to go inside and pout for five minutes before moving on to something else. Just because you’re indoors doesn’t mean you can’t still fly a kite though! 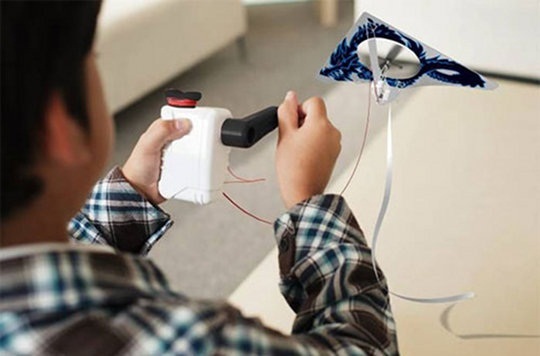 Takara Tomy decided that flying kites is so much fun that they would create the HomeKite. This is similar to a remote controlled helicopter, but instead of being powered by batteries, it’s charged by you. There is a hand crank that is attached to the kite via cord, and that will be how it goes airborne. There are a variety of styles to choose from, and it will cost you somewhere around $51 to take home. This sounds like a perfect opportunity to teach your kids something science related!